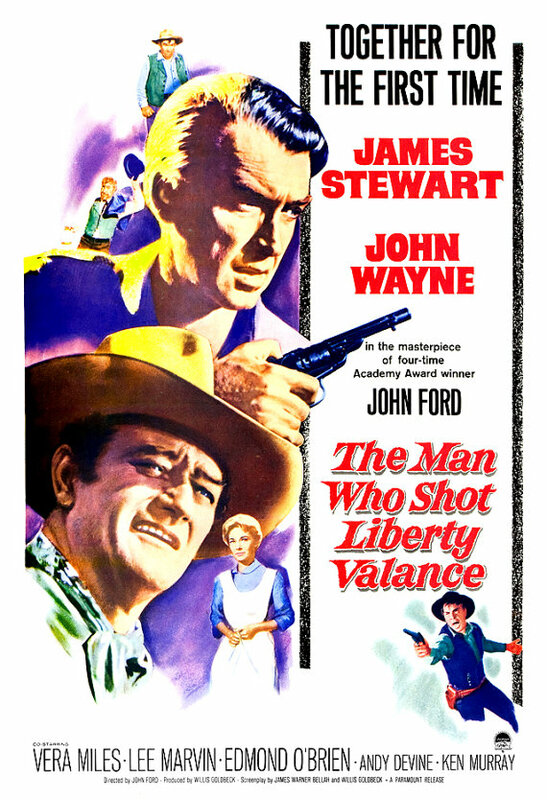 The Man Who Shot Liberty Valance is a 1962 western directed by John Ford, one of about a million he made with John Wayne. It's about the inexplicably named Ransom Stoddard, an old man who the movie tries to convince us is a young man even though he's being played by Jimmy Stewart, who is clearly in his fifties. We mention this briefly in the podcast, but who names their kid Ransom? If you name your kid Ransom and that kid gets kidnapped at some point, that's kind of on you, isn't it? ANYWAY, Ransom, who goes by the nickname "Ranse", which is a whole other can of worms not worth getting into right now, gets mixed up with the goings-on in a small town called Shinbone-- okay, you know what? Someone was clearly just throwing darts at someone else who was holding up a dictionary and flipping through its pages when they were settling on the names of people and locations in this movie. Any lesser movie might not have been able to pull this off, but it's a testament to the strength of the acting and script that the two of us weren't just constantly muttering "Shinbone?" or "Ransom?" in disbelief the entire time we were watching the movie. NEXT TIME: The introduction of a new segment guaranteed to be a fan-favorite, "How Racist is This Movie Going to Be?"